Thursday 28th September 2017 – 6.20pm – Murray MacGregor. Two men have been airlifted with serious burns after the light aircraft they were in crashed. The incident happened in field beside Wolds Lane, just outside Wolvey in Warwickshire at about 4.00pm on Thursday afternoon. Two ambulances, a senior paramedic officer and two air ambulances were sent to the scene. Both the Warwickshire and Northamptonshire Air Ambulance and the Midlands Air Ambulance from Staffordshire travelled with doctors on board. Tuesday 26th September 2017 – 1.20pm – Jamie Arrowsmith. A collision involving three lorries closed the southbound carriageway of the M6 this morning and left one patient requiring treatment from ambulance staff and transporting to hospital. West Midlands Ambulance Service was called to the southbound M6, between junctions 1 and the A14/M1 interchange just after 10am and sent one ambulance, a paramedic officer, a rapid response paramedic and the Warwickshire and Northamptonshire Air Ambulance to the scene. A West Midlands Ambulance Service spokesman said: “On arrival, crews discovered one of the lorry drivers, a man believed to be in his 40s, who was trapped inside the cab of his vehicle. “Ambulance staff worked closely with the fire service to access the patient, a process which involved building a platform to enable staff to work at the same height of the cab. “Following an initial assessment of the man, the fire service cut away parts of the cab to give crews space to work inside and treat him. “The man, who was treated for a lower leg injury and an abdominal injury, was immobilised and freed from the cab before being placed on to a scoop stretcher and transported to University Hospital Coventry and Warwickshire for further treatment. Tuesday 26th September 2017 – 9.45am – Jamie Arrowsmith. One man has been treated and taken to hospital after a chemical lorry overturned as it left a motorway. West Midlands Ambulance Service was called to the southbound exit slipway at junction eight of the M5, where the motorway links to the M50, just before 12.15am this morning (Tuesday) and sent one ambulance, a paramedic officer and the Trust’s Hazardous Area Response Team (HART) to the scene. A West Midlands Ambulance Service spokesman said: “The lorry driver, a man believed to be in his 50s, was the only patient. He was treated for cuts to his head and grazes to his arm before being transported to Worcester Royal Hospital. Notes to Editors: If used, please credit the image/videos to West Midlands Ambulance Service. Monday 25th September 2017 – 10.05am – Murray MacGregor. Five people have been hurt, four seriously, in a crash that also left a man dead. The incident happened at the junction of the A438 and A417 Ledbury at just before 11.40pm last night (Sunday). Four ambulances, three emergency doctors and a paramedic officer were sent to the scene. A West Midlands Ambulance Service spokesman said: “We were initially called to reports of a two car collision with one vehicle in a hedge. “On arrival, sadly it was immediately obvious that nothing could be done to save the man in one car and he was confirmed dead at the scene. “There were five people in the other car; two adults and three children. “A two-year-old girl was unconscious; ambulance staff were told that she had been pulled from the car by a lorry driver who had stopped to assist. She was anaesthetised at the scene and was taken to the paediatric major trauma centre at Birmingham Children’s Hospital on blue lights with one of the doctors traveling with the ambulance crew. “A seven-year-old boy went to the sane hospital with multiple injuries. Again, a doctor travelled with the child as he was taken on blue lights. “A boy of five had suffered a number of injuries and was also taken to Birmingham Children’s Hospital with the third doctor travelling. “The front seat passenger was a 38-year-old woman. She was taken to the major trauma centre at the Queen Elizabeth Hospital Birmingham. Friday 22nd September 2017 – 3.45pm – Claire Brown. 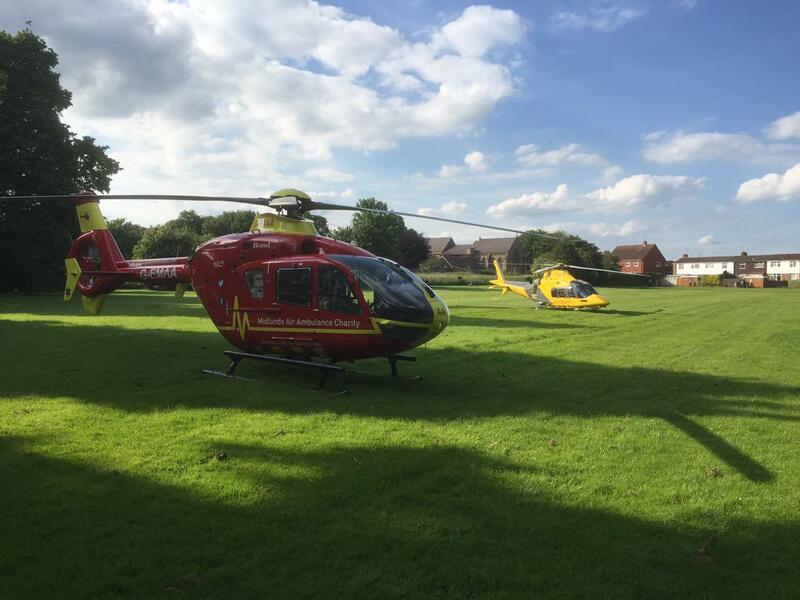 The Midlands Air Ambulance from Cosford joined land crews in Stourbridge earlier this afternoon to provide trauma care to an elderly man who had been involved in a road traffic collision. West Midlands Police called the Trust’s control room shortly before 12.30pm today reporting a collision involving a car and a pedestrian outside their police station on the Stourbridge New Road, Stourbridge. An ambulance, two paramedic officers and the Midlands Air Ambulance from Cosford with a MERIT trauma doctor on board attended the scene. Friday 22nd September 2017 – 2.15pm – Claire Brown. A man who was involved in a collision with a lorry in Wolverhampton this morning needed specialist trauma care from ambulance staff. West Midlands Ambulance Service was called to Warstone Road Shareshill, Wolverhampton at 10.45am earlier today (Friday). An ambulance, a paramedic officer, the Midlands Air Ambulance from Tatenhill attended the scene together with a MERIT trauma doctor and the Cosford air ambulance crew who responded by car. Tuesday 19th September 2017 – 5.40pm – Murray MacGregor. A breakdown recovery worker has suffered a serious leg injury after a crash where he was working on a broken down car. The incident happened at about 3.40pm on Pershore Lane in Hindlip, Worcestershire. An ambulance, a paramedic officer, a senior paramedic officer and the Midlands Air Ambulance from Strensham were sent to the scene. A West Midlands Ambulance Service spokesman said: “Crews were told that a 4×4 had collided with the back of the recovery van which then collided with the broken down. The worker was trapped between the van and broken down car. “The recovery worker, a man of about 30, had suffered serious injuries to his leg. “He was treated at the scene by ambulance staff before being taken by land ambulance to the major trauma centre at the Queen Elizabeth Hospital Birmingham. The critical care paramedics from the air ambulance travelled with the ambulance. Thursday 21st September 2017 – 1.40pm – Murray MacGregor. Senior representatives from West Midlands Ambulance Service, Hereford & Worcester Fire and Rescue Service, Shropshire Fire & Rescue Service and West Mercia Police came together today to publicly pledge their commitment to work towards being dementia friendly organisations. Earlier this year, The National Fire Chiefs Council (NFCC), The National Police Chiefs Council (NPCC) and the Association of Ambulance Chief Executives (AACE) pledged their commitment and since then local emergency services across the UK have also followed suit. West Midlands Ambulance Service Chief Executive, Anthony Marsh, said: “As an organisation, our staff work on a daily basis with patients who live with conditions such as dementia and Alzheimer’s disease. We pride ourselves on the care and compassion that we show to such patients but will always strive to do more to help them in their hour of need. HWFRS Chief Fire Officer Nathan Travis said: “HWFRS already works closely the Alzheimer’s Society, Age UK, and local dementia groups to ensure that vulnerable people with dementia are protected against the risks of fire. Employers everywhere should do all they can to end mental health stigma and discrimination in the workplace says Shropshire’s Chief Fire Officer, Rod Hammerton. “The stigma and prejudice that has surrounded mental health for years has no place in today’s workplace and employers must lead the fight to stamp it out. Addressing mental health issues in the same positive way we address physical health is a vital part of sustaining and supporting a healthy workforce,” he said. Assistant Chief Constable of West Mercia Police, Martin Evans said: “We are proud to stand here today with our blue-light colleagues to reaffirm our commitment to protecting people living with dementia from harm. Wednesday 20th September 2017 – 8.45am – Claire Brown. Nothing could be done to save the driver of a car yesterday following a road traffic collision in Bidford-on-Avon. West Midlands Ambulance Service received several 999 calls to reports of a car which had collided with a tree on Buckle Street in Bidford-on-Avon shortly after 4.30pm yesterday (Tuesday). Two ambulances, a paramedic officer and the Warwickshire and Northamptonshire Air Ambulance attended the scene along with police and fire colleagues. Tuesday 19th September 2017 – 12.55pm – Murray MacGregor. An elderly woman has been airlifted to a major trauma centre with potentially life threatening injuries after a crash between a car and a lorry. The incident happened on the A41 outside Grindley Brook Garage in Grindley Brook to the north west of Whitchurch at around 12.20pm today (Tuesday). A West Midlands Ambulance Service spokesman said: “The Midlands Air Ambulance from Staffordshire and a land ambulance were initially sent to the scene. “They found a car that had suffered significant damage and the woman driving unconscious. “After an initial assessment, the crews requested a doctor and the Midlands Air Ambulance from Cosford was also sent. “Ambulance staff worked with firefighters, to rapidly extricate the woman from the car. She was treated for serious injuries and was anaesthetised as soon as the doctor arrived. “She was then airlifted to the major trauma centre at Royal Stoke University Hospital. Tuesday 19th September 2017 – 10.45am – Murray MacGregor. A pedestrian has been seriously hurt after a collision with a 4×4 vehicle last night. It happened on Brays Road in the Sheldon area of Birmingham at just before 10.15pm last night (Monday). An ambulance, a paramedic officer, the MERIT Trauma doctor and critical care paramedic and the West Midlands CARE Team were sent to the scene. A West Midlands Ambulance Service spokesman said: “On arrival, ambulance staff found a 26-year-old man who had suffered multiple injuries after a collision with a vehicle. “The man, who was semi-conscious, was assessed and treated at the scene by ambulance staff and the doctors. He was immobilised and taken on blue lights to the major trauma centre at the Queen Elizabeth Hospital Birmingham where medics were on standby to receive him. A doctor travelled with the ambulance crew. Monday 18th September 2017 – 4.10pm – Murray MacGregor. A cyclist has suffered very serious injuries after riding into the back of a parked lorry. It happened in Sherlock Street in Birmingham this lunchtime. Two ambulances, a paramedic officer and the Warwickshire and Northamptonshire Air Ambulance were sent to the scene after a number of calls at 12.20pm. A West Midlands Ambulance Service spokesman said: “On arrival, ambulance staff found a cyclist, who was estimated to be in his 20s, who had suffered a serious head injury. He was not wearing a helmet. Monday 18th September 2017 – 9.35am – Murray MacGregor. A pedestrian has suffered multiple injuries after a collision with a car in the early hours of this morning. It happened outside the McDonalds Restaurant on Bristol Road in the Edgbaston area of Birmingham at about 1.35am (Monday). Two ambulances and the MERIT trauma doctor and critical care paramedic were sent to the scene. A West Midlands Ambulance Service spokesman said: “When crews arrived they found a 23-year-old man who was lying in the road. “The car, which was nearby, had sustained significant damage to the windscreen. The driver was unhurt. “The pedestrian had suffered multiple injuries. He was immobilised at the scene, but due to the incident being close to the major trauma centre at the Queen Elizabeth Hospital Birmingham, the crew left scene just 14 minutes after arriving. Friday 15th September 2017 – 12.25pm – Jamie Arrowsmith. Ambulance crews have treated two patients at the scene of a serious fire in Nuneaton this morning. West Midlands Ambulance Service was called at 8.52am to reports of a fire at an industrial unit on Tuttle Hill. One ambulance and a paramedic officer were sent to the scene. A West Midlands Ambulance Service spokesman said: “There were two patients for crews to treat. “The first of whom was a man, believed to be in his 40s. He was treated for the effects of smoke inhalation and discharged at the scene. “A woman, also believed to be in her 40s, was treated for the effects of shock and again, discharged at scene. Friday 15th September 2017 – 10.55am – Jamie Arrowsmith. A young girl has been treated for multiple injuries and taken to hospital following a collision with a car this morning. West Midlands Ambulance Service was called to Blakemore Road, near to the junction with Castlefort Road, Walsall Wood, shortly before 8.40am and sent an ambulance and the Midlands Air Ambulance from Cosford to the scene. A West Midlands Ambulance Service spokesman said: “Crews arrived to find a young female toddler with multiple injuries following a collision with a car. “She was treated by ambulance staff for a head injury, a nose injury and hip injuries. She was immobilised with the use of a scoop stretcher and given pain relief before being taken to Birmingham Children’s Hospital by land ambulance for further assessment. Wednesday 13th September 2017 – 9.30am – Jamie Arrowsmith. A lorry driver who was trapped for approximately 45 minutes after his vehicle overturned and was involved in a collision with a car has been fortunate to walk away without serious injury. West Midlands Ambulance Service was called to the junction of Shrewsbury Road and the A528 in Preston Gubbals, Shrewsbury, just after 4.30pm yesterday (Tuesday) and sent one ambulance, a paramedic officer and the Midlands Air Ambulance from Cosford to the scene. A West Midlands Ambulance Service spokesman said: “Crews arrived to find a man, believed to be in his 40s, trapped inside the cab of his lorry after it had overturned and been involved in collision with a car. “Once the fire service had cut him free, he was able to get himself out of the vehicle and walk to the ambulance. “He was treated for cuts to his hand, shoulder pain and a minor head injury before being taken to Royal Shrewsbury Hospital. “Considering the damage suffered to his vehicle, he is extremely fortunate to have not suffered more serious injuries. Tuesday 12th September 2017 – 11am – Jamie Arrowsmith. A man has died after falling from his motorbike in a single vehicle road traffic collision last night. West Midlands Ambulance Service was called to Glebe Street in Stoke on Trent at 11.55pm and sent two ambulances, a paramedic officer and a BASICS doctor to the scene. A West Midlands Ambulance Service spokesman said: “Crews arrived to find a motorcyclist in cardiac arrest having suffered serious injuries in the incident. Tuesday 12th September 2017 – 9am – Jamie Arrowsmith. A woman, who was trapped in a car for an hour, has been taken to one of the region’s major trauma centres after a collision between a car and a lorry last night. West Midlands Ambulance Service was called to Cannock Road in Featherstone at 8.35pm and sent one ambulance, a paramedic officer and a MERIT trauma doctor to the scene. A West Midlands Ambulance Service spokesman said: “On arrival, crews discovered a woman, believed to be in her 20s, who was trapped in the passenger seat. “Ambulance staff worked closely with the fire service to free the patient, a process which took about an hour. “She was assessed and treated for arm and chest injuries and taken on blue lights and sirens to Queen Elizabeth Hospital, Birmingham. Monday 11th September 2017 – 2.00pm – Claire Brown. A road traffic collision involving a motorcycle and a car during rush hour in Walsall this morning has left one man requiring further care in a major trauma centre. West Midlands Ambulance Service was called to the junction of Birch Lane and Mill Road, Pelsall, Walsall at 8.30am today (Monday). An ambulance and the Midlands Air Ambulance from Cosford with a MERIT trauma doctor on board attended the scene. Friday 8th September 2017 – 3.10pm – Jamie Arrowsmith. A woman has been anaesthetised after suffering serious injuries following a collision with a van this afternoon. West Midlands Ambulance Service was called to Lawnswood Road in Wordsley, shortly after 1.15pm and sent two ambulances, a paramedic officer and the Midlands Air Ambulance from Cosford to the scene. A West Midlands Ambulance Service spokesman said: “Crews arrived to find an elderly woman who had suffered multiple serious injuries, including a head injury, following a collision with a van. “She received advanced trauma care at the scene and was anaesthetised in order to help stabilise her condition. “She was then transported to Queen Elizabeth Hospital, Birmingham, by land ambulance with the doctor and critical care paramedic from the air ambulance also travelling with her, to help continue treatment enroute. Friday 8th September 2017 – 2.30pm – Jamie Arrowsmith. A car driver has died and three other people have been injured following a collision with a lorry this morning. West Midlands Ambulance Service was called to Brinklow Road in Coventry shortly before 11.15am and sent two ambulances, a paramedic officer and the Warwickshire and Northamptonshire Air Ambulance to the scene. A West Midlands Ambulance Service spokesman said: “On arrival, crews discovered the car driver, a man, still inside his vehicle with serious injuries. “There were three occupants in the lorry, one of whom was trapped as a result of the collision. “The man, believed to be in his 20s, was cut free with the help of the fire service. “He was treated for a serious leg injury and suspected pelvic injury. He was immobilised and alerted in to University Hospital Coventry and Warwickshire by land ambulance. The air crew travelled with the patient to help continue treatment enroute to the hospital. “The remaining two patients, a man in his 40s and a man in his 30s, were treated for minor hand and leg injuries respectively. Tuesday 5th September 2017 – 5pm – Jamie Arrowsmith. A two-car collision, in which one of the vehicles also collided with a house, has left two patients requiring treatment from ambulance staff and transporting to hospital this afternoon. West Midlands Ambulance Service was called to the junction of Lockhurst Lane and Durbar Avenue in Coventry shortly before 2.25pm and sent two ambulances, a paramedic officer and the Warwickshire and Northamptonshire Air Ambulance Critical Care Car to the scene. A West Midlands Ambulance Service spokesman said: “On arrival crews discovered two cars that had been in collision, one of which had gone on to hit a house. “The driver of that car, a man believed to be in his 60s, was treated for head and hip injuries. He was immobilised as a precaution and taken to University Hospital Coventry and Warwickshire for further assessment. Tuesday 5th September 2017 – 5.30pm – Jamie Arrowsmith. A car driver, who was trapped for about 50 minutes, had to be cut free through the roof before being airlifted to hospital with multiple serious injuries this afternoon following a collision with a lorry. West Midlands Ambulance Service was called to Wodehouse Lane in Gospel End at 3.20pm and sent an ambulance, a senior paramedic officer and the Midlands Air Ambulance from Cosford to the scene. A West Midlands Ambulance Service spokesman said: “Crews arrived to find a car that had suffered significant damage in the collision with the driver, a man believed to be in his 20s, trapped inside. “Ambulance staff continually assessed the man as they worked closely with the fire service to cut him free through the roof. “He was treated for multiple injuries, including to his leg and pelvis. He was immobilised, given pain relief and carefully moved on to the air ambulance before being airlifted to Queen Elizabeth Hospital, Birmingham for further treatment. Tuesday 5th September 2017 – 9.55am – Murray MacGregor. 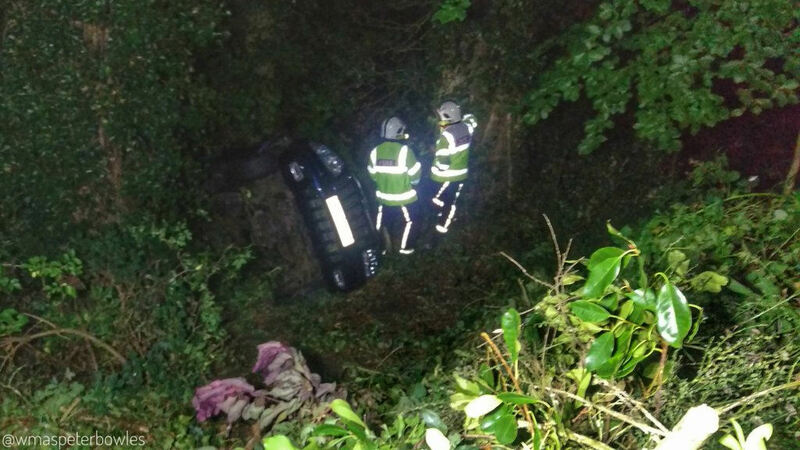 An elderly man has escaped serious injury despite his car going down a 40-foot embankment backwards. It happened at just before 7.00pm last night on Ounty John Lane in Stourbridge. The Hazardous Area Response Team (HART) and an ambulance were sent to the scene. A West Midlands Ambulance Service spokesman said: “On arrival, ambulance found a car that had gone backwards down the steep slope and had turned over onto the passenger side. “The man had been able to climb out of the vehicle through the sun roof but was unable to get back up the slope. “While HART staff went down to the man to treat him firefighters were setting up a rope line set. “He was complaining of shoulder and backt pain, but the injuries were remarkably minor considering where his car had ended up. 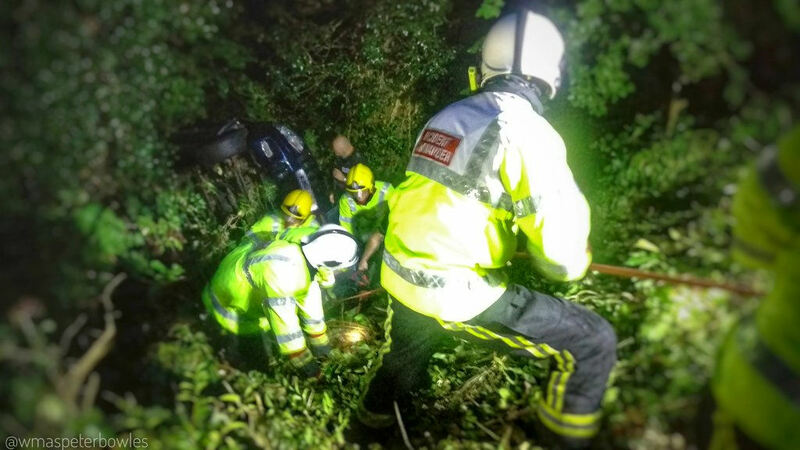 “The man was immobilised on a specialist MIBS (multi integrated bodysplint stretcher) stretcher and was then lifted back up the embankment to the roadway. Monday 4th September 2017 – 2.15pm – Murray MacGregor. 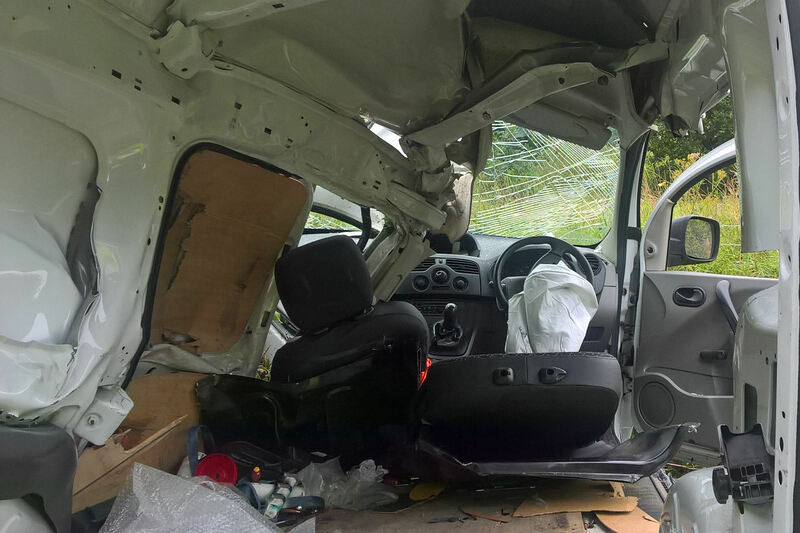 A van driver has been extremely lucky not to have suffered far more serious injuries after the vehicle he was driving struck a tree, side on. It happened at about 9.45m this morning on Banbury Road, just outside Warmington on the road to Gaydon in Warwickshire. A West Midlands Ambulance Service spokesman said: “On arrival, ambulance staff found a small Renault van that had collided with a tree side on causing significant intrusion on the passenger side of the vehicle. “Thankfully, there was no one in the passenger side of the vehicle given the damage. “The driver, a middle-aged man was initially unconscious and had also suffered chest and back injuries. Friday 1st September 2017 – 2.45pm – Jamie Arrowsmith. A total of 12 patients have been treated by ambulance staff on the M5, 11 of whom have been taken to hospital, following a six-vehicle collision. West Midlands Ambulance Service was called to the northbound carriageway, between junctions eight and seven, at 12.05pm and sent four ambulances, a paramedic officer and the Midlands Air Ambulance crew from Strensham in a rapid response vehicle to the scene. A West Midlands Ambulance Service spokesman said: “On arrival, crews discovered five cars and a lorry that had been in collision. “The 11 patients requiring further treatment at Worcester Royal Hospital were conveyed on four ambulances. “On the first ambulance, there was a woman in her 50s who was treated for wrist and ankle injuries, a woman in her 20s who was treated for leg and facial injuries and two young boys who were treated for facial injuries and cuts to the foot respectively. “The second ambulance conveyed a man in his 20s with chest pain, a teenage woman with a suspected fractured arm and a second teenage woman with arm and head pain. “A woman in her 20s was treated for a fractured jaw and her injuries to her face whilst a man in his 20s was treated for a shoulder injury. They both travelled to hospital on the same ambulance. “Finally, two women in their 20s were treated for minor injuries before also being taken to Worcester Royal Hospital. Friday 1st September 2017 – 11.30am – Jamie Arrowsmith. A young boy has suffered fatal injuries following a collision with a lorry last night. West Midlands Ambulance Service was called to Churchbridge, Oldbury, near to Total Birchley Park Service Station, just before 10pm and sent one ambulance, a paramedic officer and a MERIT trauma doctor to the scene. A West Midlands Ambulance Service spokesman said: “On arrival at the scene, crews discovered a young boy with serious injuries following the collision. “Unfortunately, it quickly became apparent that nothing could be done to save him and he was confirmed deceased.